Since the middle of the 20th Century, no American city has experienced the severe economic shock experienced in Detroit. Analyzing the housing of the city, I found the city’s shrinking housing stock has declined at almost precisely the same amount per year, every year: 1% of the existing stock lost. This underlying regularity, independent apparent yearly fluctuations, created the current landscape of the city and shape possible responses. The numbers quantifying the cause of urban decline in the American Rustbelt are staggering. Between 1980 and 1990 alone, the Northeast and Midwest lost 1.5 million manufacturing jobs and $40 billion (in 1998 $) in aggregate manufacturing worker earnings. During the same time period, central counties of the 28 metro areas in the Midwest and Northeast regions lost 1 million manufacturing jobs. (Kasarda, 2001) The industrial jobs, generally secure and good-paying, constituted the core of the urban economy. Their departure was magnified many times as it rippled more broadly through the economy, as the service jobs supported by the core industries disappeared. African Americans were particularly hard hit. Millions of jobs left, but new jobs were not easily accessible and often required high education levels. These so-called spatial and skill mismatches resulted in skyrocketing jobless rates among central-city blacks. One economist found that by 1990, four fifths of young inner city school dropouts were unemployed. In Detroit, by 1990 Detroit was 79% black and the surrounding suburbs 79% white. For the uninitiated, Thomas Sugrue’s excellent Origins of the Urban Crisis contains a detailed history of the origins of economic decline. Before I plunge into an analysis of the City of Detroit’s housing stock, it should be noted that the majority of jobs and people in the metropolitan area live outside of the city limits, and also that within the city there exists many middle class and even upper class neighborhoods. Although containing vacant land and buildings, the city presents the visitors a strange combination of energy and investment with decay and abandonment. (Captured well in this blog post) The map to the right, produced by the Southeast Michigan Council of Governments (SEMCOG), shows the vast scale of the metropolis — only the green central municipality is the City of Detroit. Economists theorize that the rate of urban decline is largely determined by the durability of the housing stock. In short, even if the jobs are gone the physical persistence of homes mean people will continue to live there. In a shrinking city, first the households size decrease as the declined population is spread more thinly among the surviving buildings. After reduced household sizes, the market begins to abandon houses. Homeowners may move to the suburbs or out of state, retaining title to the property. Some default on mortgages or fail to pay taxes, resulting in thousands owned by various units of government. In Detroit, tens of thousands of vacant buildings and lots are owned by the city, state, county, and other public agencies. Economists Edward Glaeser and Joseph Gyourko observed in a 2005 paper that the maximum rate of decline for housing seems to be about 1% per year. Without speculating the causes of this speed limit to housing decline, they observe that no matter how fast the jobs disappear, the housing stock rarely declines at a faster rate. I created a graph showing the number of housing units from 1970 to 2008. The U.S. Census counts show a greater decline than is reflected in the construction and demolition permits, a discrepancy caused by unpermitted activity, record-keeping error, and perhaps different definitions of housing units. However, I defer to the U.S. Census to establish starting and end points. The annual net changes from housing permits are inflated 11% so that the total matches the observed change from U.S. Census data over the same period. This method captures the variability shown above, while ensuring the starting and ending points match the Census. Superimposed on the results is a fixed 1% annual decline from the 1970 housing units. The correlation is striking. If we extend beyond, we can see what the formula predicts. Again, this is not a projection, but simply an extrapolation of a 1% rate of decline from the 1970 Census. The true rate of decline may vary from the formula thanks to public policies, such as public demolitions, or arson. Of course, at any point if the city started growing again we would expect the actual number of units to level off or even increase. How public authorities can plan during decline is an important and under-studied issue. The Shrinking Cities project has sparked discussions around this topic, and officials in Michigan have become leaders by virtue of their unique circumstances. The Genesee County Land Bank in the Flint area (which has experienced similar decline, albeit at a smaller scale) has become a national leader. Their approach is that a government agency should obtain full title to abandoned properties, demolish or stabilize them, clean the lots, and then sell them back to the private market in a controlled way. By limiting the supply the government can realize market, or above-market prices for vacant land and buildings. There have been discussions for creating a similar land bank for Detroit, or Wayne County, and this 2006 report by students at the University of Michigan is an excellent examination of the issue. Of course, for the land bank model to work some private-sector demand must exist for land, and revenues from property sales must cover the costs of program administration. In the absence of a demand for land for new housing in Detroit, any hypothetical land bank would have to find buyers interested in land for commercial, agricultural, or other purposes. Most troubling is the relationship between economic decline, physical abandonment, and social problems. Economists argue the low housing prices in the city will attract those with low levels of “human capital,” creating a cycle of decline. 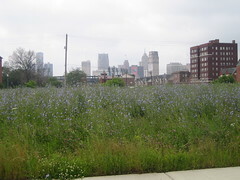 �If low levels of human capital then create negative externalities or result in lower levels of innovation, this becomes particularly troubling because a self-reinforcing process can result in which an initial decline causes concentrated poverty, which then pushes the city further downward.” The barriers to overcome this cycle of economic decline are great, and renewal in Detroit will mean not only increasing numbers of jobs and residents but a reversal of decades of compounding problems. I suppose it has become the nature of things to wax and wane. All major metro area will fade over time. It is our job to keep them from fading to the extend that they become useless. To keep “box stores” from becoming the homes of squatters and to demolish and recycle old home or restore them. There is no need for places to become dead space in the middle of cities. Detroit is mostly proof of the need for urban growth boundaries. Detroit lost 1.2 million residents. All those residents did was relocate within other parts of the region, to Wayne, Oakland, and Macomb counties. (From 1960 to 2000 these three counties only added 200,000 in population.) What happened is that Detroit’s housing was made redundant by the construction of new houses in the suburbs. Given the centrality of the automobile to the region, it should be no surprise that the region has the most significant amount of outmigration from the core and exurban development.